Originally I think Alisa wanted me to have sweet potato pancakes. But the problem is in the mornings I rarely have sweet breakfast food cravings. If I crave pancakes, waffles or French toast, it’s generally for “breakfast at dinner.” Instead, I decided to try her other recommendation: their delicious biscuits and gravy. And…. Well, and I’m not sure what else. The restaurant was definitely busy. My waitress was friendly but seemed frazzled. Have you ever had a time where you’re talking to someone but their mind’s somewhere else? Yeah, I’ve been that way before. But I HATE it when a waitress, or a bank teller, or anyone else in a service realm has those moments. Sure, it’s unreasonable for me to expect everyone to be on-point all the time. But when you’re a waitress on a Sunday morning during “church hour” you gotta step up your game. OK, so all frustrations aside, what was I going to eat? Did I want a huge order of b&g? Or did I want that as a side dish? I found the omelette section and was surprised and excited to see that not only did I get an omelette, but I also get to choose from hash browns, home fries, grits, fresh fruit, sliced tomato or cottage cheese. 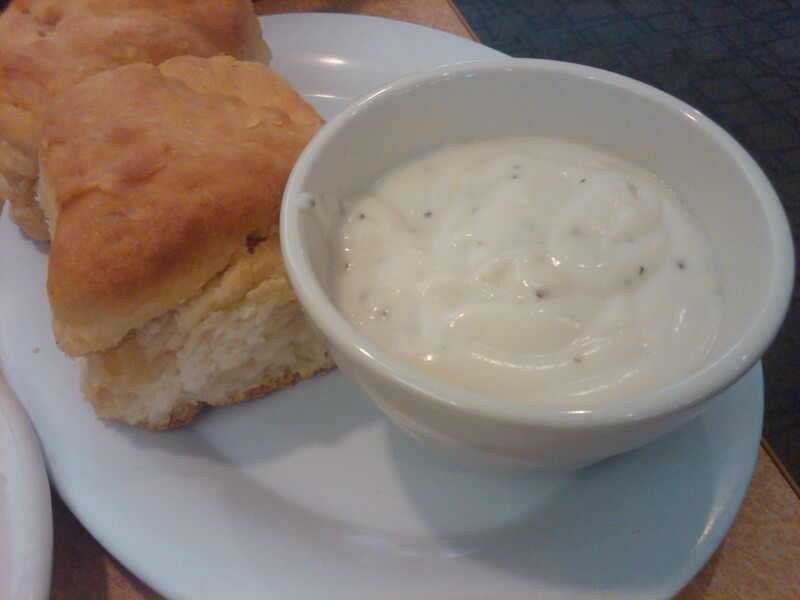 BUT, I also got to choose one of toast (white or cinnamon raisin) or biscuits and gravy. Holla! Yes, this is what I want! And they had a fairly good selection of omelettes, plus you could create your own omelette with a decent selection of ingredients. I ended up choosing the Baja Omelette (bacon, avocado, tomato, monterrey jack cheese). Except I wasn’t feeling bacon. I know, a crime against deliciousness, right? My bad. For my sides I had biscuits and gravy (of course) and home fries. 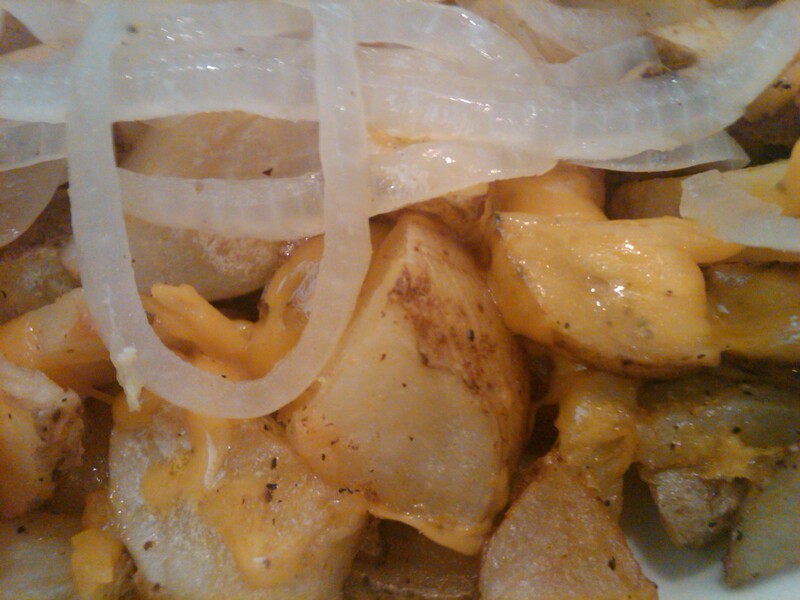 The waitress suggested topping the fries with cheese and onions. Who am I to argue? Bring it! I ordered my meal, substituting sausage for the aforementioned bacon. Then sat around and people watched. I watched people walk in the restaurant and run straight into the “Please Wait to be Seated” sign. I watched people walk in and start bitching, loudly and passive aggressively about the number of available tables. Or the location of said tables. I watched people walk in and start making out. I listened people talk about alien abductions and philosophy. And I watched people sitting at their tables, generally displeased with life, their breakfast companion, and well, I’m not sure what else. Everything in general. Finally! My food! OK, not finally. It came reasonably quickly. And it looked delicious. The biscuit was light and fluffy, as promised. The gravy was seasoned, but didn’t have sausage in it (or at least I didn’t get any sausage). This normally wouldn’t bother me, but my omelette also didn’t have sausage in it. Oh, the humanity! What’s breakfast without sausage! Seriously, though, my omelette was just OK without any meat in it. It felt bland and lifeless. I watched the waitress write the substitution on the ticket so unless there was a problem between my table and the kitchen, I’m sure it was just a kitchen oversight. I know I could have sent the omelette back, but I didn’t really want to eat everything else while waiting for it (or let it get cold). So I pushed onward and upward. The home fries (which are just cubed potatoes, for those who didn’t know – as I didn’t). Were good. I’m so glad I added the cheese and onions. Between the home fries and biscuit and gravy, I really had enough to eat. I am sad I didn’t get to try the omelette in all its glory. If I went back: I’d go later in the day (but they’re only open til 2), and not on a Sunday. The angry church crowd, while entertaining and ironic, was a little overwhelming. As I left some lady was having a nervous breakdown over cream and brown sugar. I’m not sure if it was because there was too much or not enough? It’s a little disheartening to have everyone hate their lives so much. 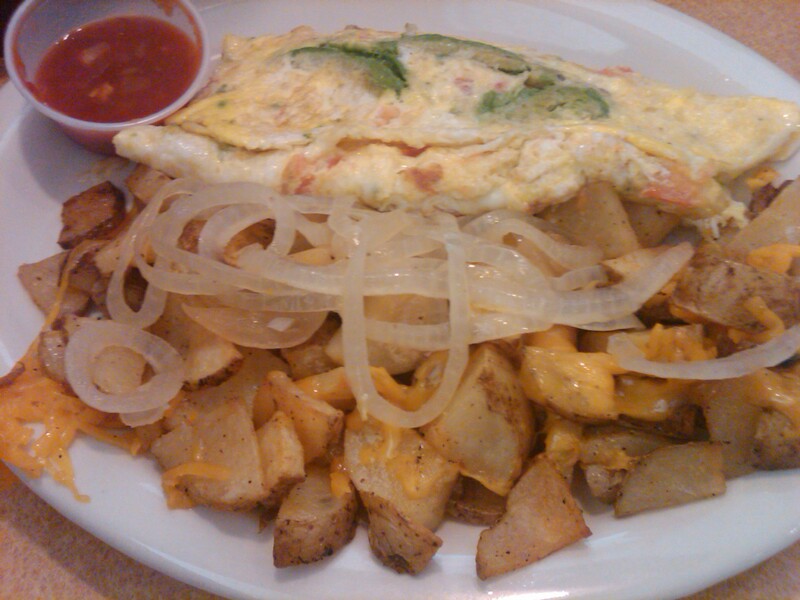 Omelette with a side of salsa and home fries covered in cheese and onions. Yum! I think I got french toast with the side of biscuits and gravy and the only thing I was super impresses with the was side of biscuits and gravy. Rocky got the fully loaded (or something of that nature) biscuits and gravy and we were NOT impressed with that, he wished he would have just gotten a double order of the side order of biscuits and gravy (it would have been cheaper and way tastier). Oh and it was a holy mess when we went in on a Saturday or Sunday morning (they were still pretty new though), and the hostess bypassed seating us 3 times (for older patrons that had clearly walked in the door after us) before I finally got fed up (because we had Connor and he was getting to be a huge mess) and said something and THEN she didn’t even believe me and the people standing waiting for their entire party (who saw us being bypassed EVERY time) had to also speak up and say “they’ve been here waiting and you’ve been ignoring them”. And even then the hostess still glared at me like I was lying to her. I would have walked out, but I figured she would have won then! And it wasn’t even the fact that they could say, well, your party has 3 and we were sitting the tables of 2 first because Connor was young enough and NEEDED a highchair anyways so we didn’t even need an extra chair! It was ridiculous! Also, our waitress left alot to be desired also. So, needless to say we haven’t been back and really don’t ever plan to go back!